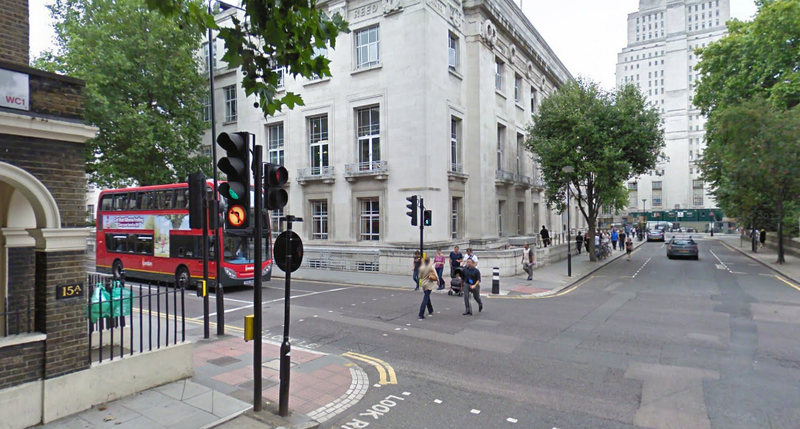 On the corner of Gower Street and Keppel Street in Bloomsbury stands the impressive inter-war building of the London School of Hygiene and Tropical Medicine. 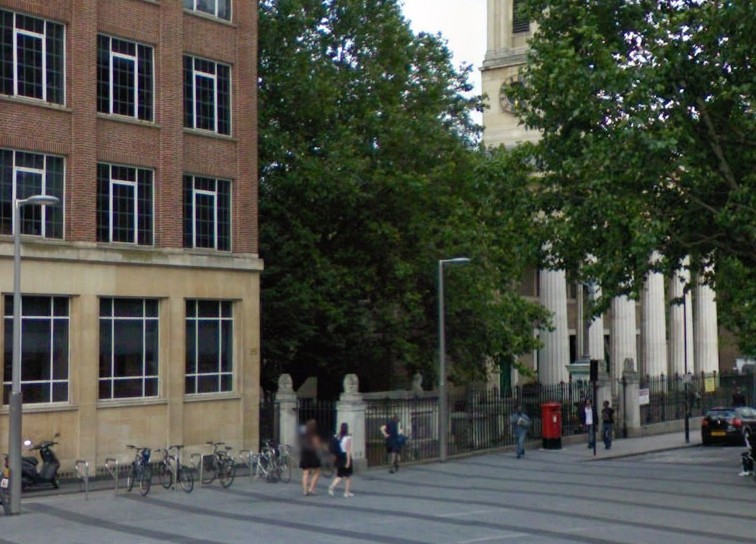 The site’s earlier history, though, is important in the history modern Shakespearean performances in the capital, linked to the RSC and the National Theatre – and it provided a haven for soldiers and sailors in London in the Great War. 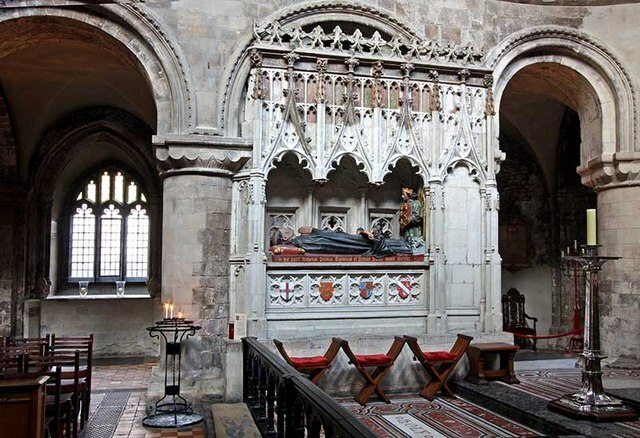 In the years before the Great War, a group of like-minded and well-connected people were campaigning to open a Shakespeare Theatre in London as a venue for the Bard’s plays in the capital. In 1913, Sir Oswald Stoll gave 1616 guineas towards the project (an enormous sum when working men’s wages were around 20 or 30s per week – a guinea was 21 shillings). Israel Gollancz (uncle of the publisher Victor Gollancz) led the project and by early 1914 a site had been found and cleared, and a competition to design the theatre was launched, with a view to opening the theatre in 1916 for the tercentenary of the Bard’s death. 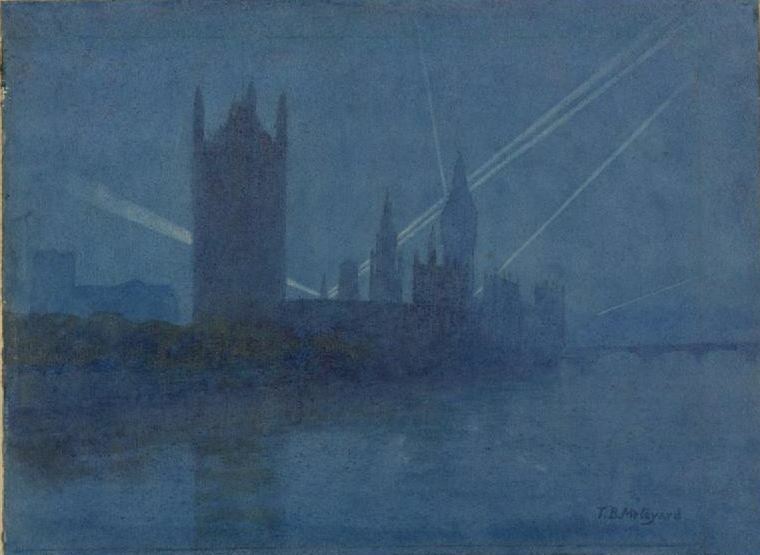 In August 1914, the project came to a halt. During the first eighteen months of the war, the YMCA and other organisations opened up places for soldiers and sailors to relax in London. Many were based around the railway termini (and we have seen that one was opened in 1917 for US servicemen: the Eagle Hut), but in August 1916 the ‘Shakespeare Hut’ was opened by Princess Victoria of Schleswig-Holstein (wife of the Duke of Saxe-Coburg and Gotha, a grandson of Queen Victoria). 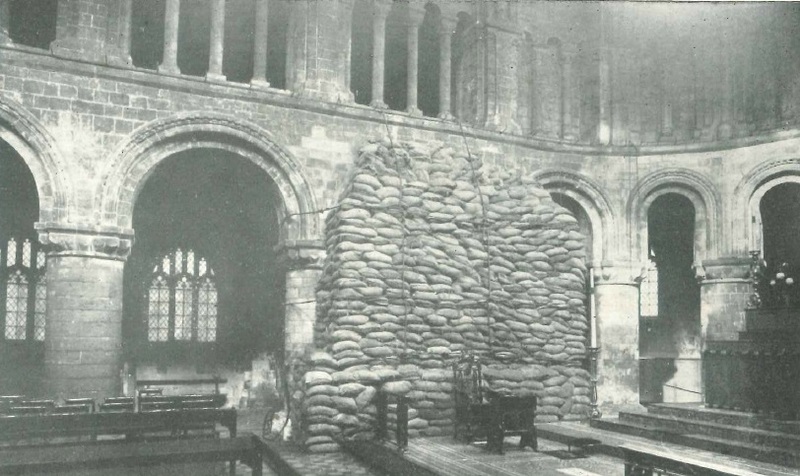 The hut was used throughout the war for entertainments and as somewhere for soldiers and sailors to sleep if they had no accommodation in the city. 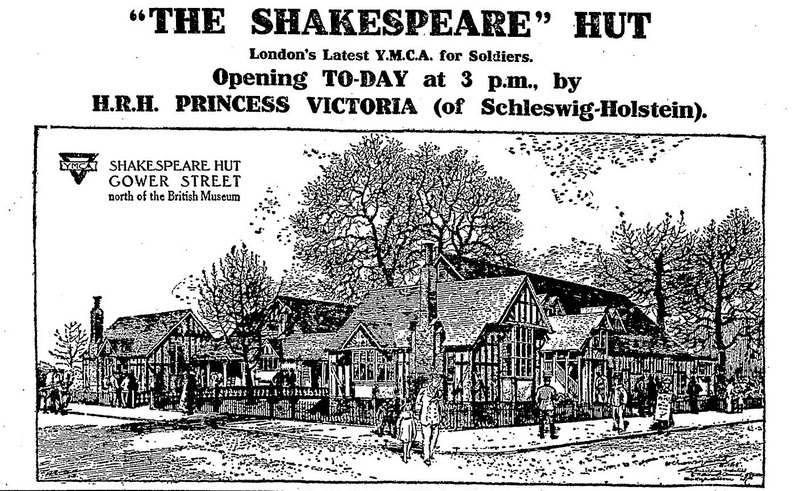 The Times reported in September 1918 that over 2,000 men were sleeping in the Shakespeare Hut each week, the most of any of the YMCA huts whose statistics they listed. 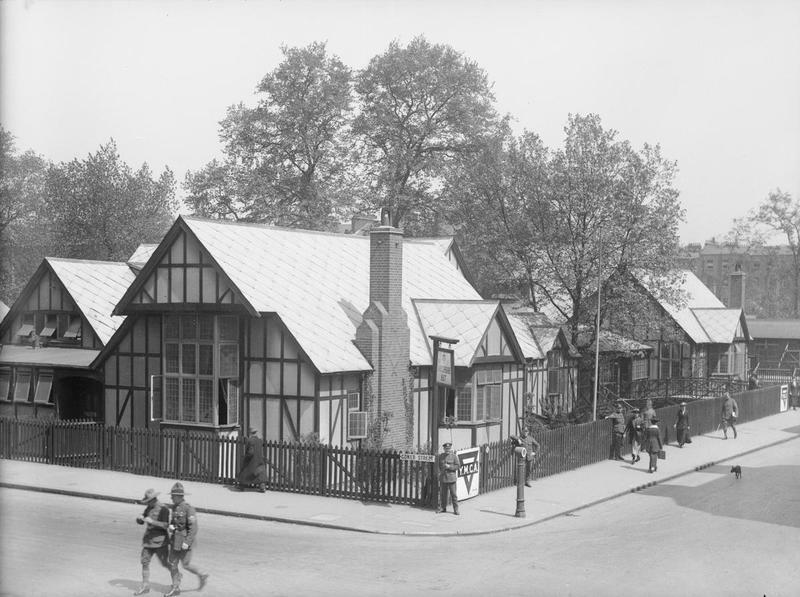 After the war, the huts on the site were made into accommodation for students at the nearby University of London (the site is close to Senate House), mainly Indian students. The site was sold in April 1922 as the site for a new School of Hygiene in the University; as Gollancz (by now Sir Israel) put it, “On the site secured for the Shakespeare Memorial National Theatre there will soon arise a Temple of Hygeia”. This new building and others around the university have completely changed the scene around the site of the hut.